ADAMNÁN (ADAM, EUNAN), hagiographer, statesman, clerical lawyer, and one of the most important figures in either Scottish or Irish history, St. Adamnán was the ninth Abbot of Iona. He was author of the most important Vita of Saint Columba, which is of great historical value for its information on monastic life. St. Adamnán also wrote the Lex Innocentium , better known as Cáin Adomnáin (Law of Adomnán) which was promulgated at the Synod of Birr (in the present-day Co. Offaly, Ireland in 697). This sought to guarantee the safety and immunity of various types of non-combatants in warfare. In addition, St. Adamnán authored De Locis Sancris , an account of a visit to the Holy Land by Arculf, a late seventh century Frankish bishop. There are some Latin canons in his name as well. St. Adamnán received monastic tonsure at Iona, where he spent most of his adult life, though there are debates about where he received his training. Regardless of where St. Adamnán received his education, he attained a level of learning rare in Early Medieval northern Europe. St. Adamnán was made Abbot of Iona in 679, and, according to St. Bede the Venerable (25th May), visits to Wearmouth Abbey in 686 and 688 led him to accept the Roman method of calculating the date of Easter (vide Paschal Controversy). St. Bede goes on to relate that St. Adamnán was unable to persuade the monks of Iona and its dependencies to adopt the Roman method. St. Adamnán’s efforts were more successful when he went to Ireland in 692. In Ireland, especially in Cos. Derry and Donegal, his name is popular in its Anglicised form, Eunan, from the Gaelic Naomh Adhamhnán. Whether or not he is the same saints as St. Eunan, who is the patron saint of the Roman Catholic Diocese of Raphoe (Co. Donegal), is not known. St. Adamnán reposed circa 704. 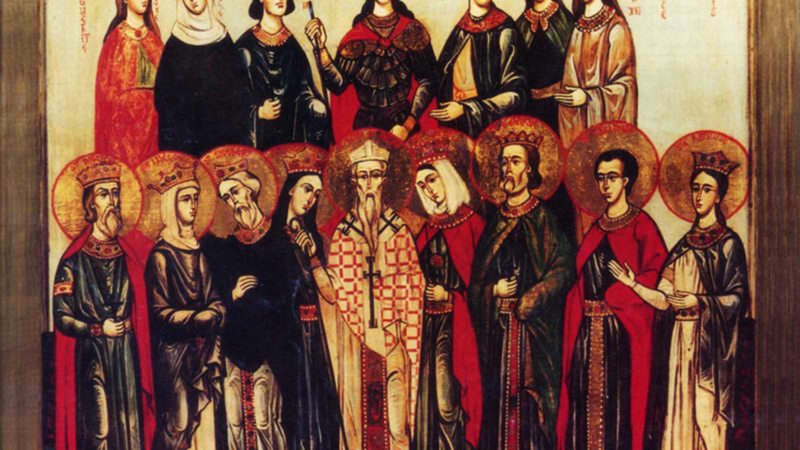 ANDREW, JOHN, PETER, and ANTHONY, deported from Syracuse to North Africa by the Saracens, who, at that time occupied Sicily. Once in Africa, they were subjected to barbaric torture and then put to death, circa 900. CISSA, St. Cissa was a disciple, and successor of St. Guthlac (11th April) as Abbot of Crowland in England. According to the Crowland Chronicle , he was buried next to St. Guthlac, though both tombs were later destroyed by the Vikings. CONSTANTIUS, a sixth century sacristan of the church of St. Stephen in Ancona in the Marches, who is greatly venerated there. 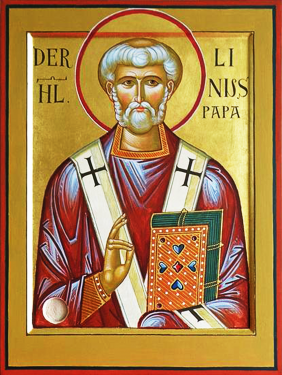 LINUS, the second Pope of Rome, from 67 until his repose in 79. St. Linus was a disciple of the Apostle Paul (29th June), one of the Seventy, is mentioned in 2 Timothy 4:21, and is venerated as a martyr.